Technical Pro is constantly building high quality equipment that will hold up to the pressures of today’s professional audio world. The engineers on this team know that every piece of equipment from their speakers to their microphones and even their headphones need to perform at high standards all the time. The HP500BT Headphone is the perfect choice for anyone who uses headphones on a regular basis and owns a Bluetooth enabled mobile device. The stylish and innovative design will give you years of high quality output! 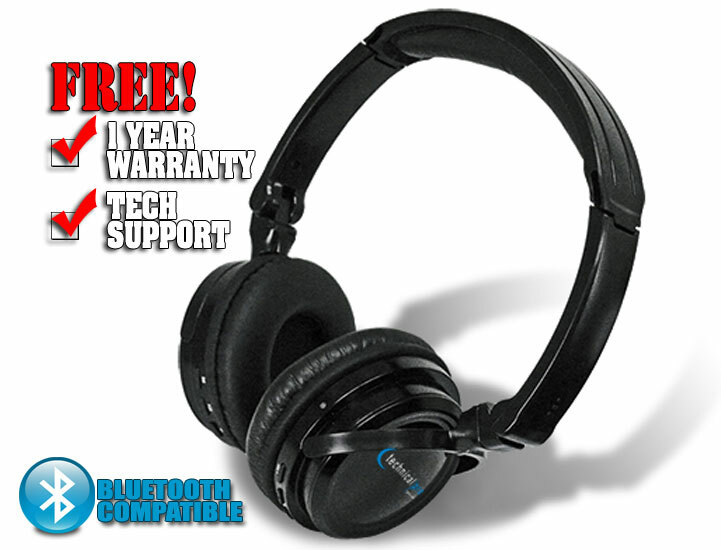 The HP500BT are professional headphones that can be used in a variety of scenarios. If you are a music lover, you will want these to enjoy all of the dynamics of your music…not just what your computer speakers can push out! Using Bluetooth technology the HP500BT is able to connect to any Bluetooth enable device such as iPod® / iPhone ® or any other mobile device wirelessly. That means you can leave your phone in your pocket on the table or basically anywhere within a 30 foot radius from the HP500BT and still listen to your audio. The built-in microphone allows you to answer phone calls and talk with your phone now where in sight. These headphones are extremely comfortable and lightweight. It is important that you headphone choice provides a high level of comfort. If you are working in a studio or as a DJ you will be wearing your headphones for hours on end and it is important that they are comfortable on your head! The headband is fully adjustable which will allow you to fit these onto any side head providing extreme comfort and an exact fit. This is also very important that your headphones fit on your head properly. The HP500BT’s will fit perfectly which will also provide the best listening experience! You will receive a focused musical output of the highest quality! The HP500BT has a professional Super Bass Driver built in. These phones are for serious music lovers! The bass reproduction and the strong low end will give you a huge sound in a compact headphone design! Close your eyes while using these to listen to your favorite music and you will think you are in a nightclub! If you are looking for professional headphones for today’s professional audio world at a price that is almost too low to believe, the HP500BT Professional Headphones is the number one choice! If you are serious about your music you will demand to listen to it at a professional level. The HP500BT’s are both stylish and built to perform at the most professional level….and at a price that is very affordable!